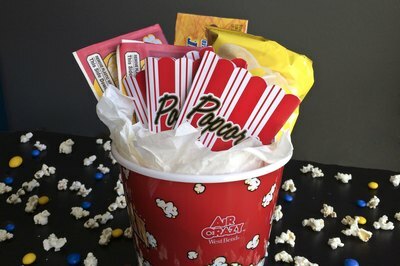 Although the contents of your movie-night gift basket may vary, a large popcorn bucket or giant bowl is a must-have. Whether your basket is for adults or children, include abundant quantities of popcorn for popping. Thinking about treats to fill the basket and organizing those goodies around themes provide you with as much fun in making the basket as the fun your recipient will have receiving the surprises. 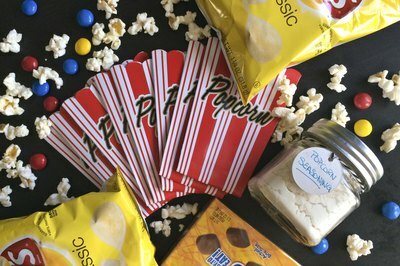 No matter what theme you choose, include individual-size, plastic popcorn bowls, paper popcorn bags or homemade paper cones so everyone has access to the best part of movie night. Make a jar of flavored popcorn seasoning with a recipe attached or add a jar of store-bought flavoring. To finish the basket, add a few candy bars and a favorite movie you would like to share, then wrap the bowl in a cozy blanket. 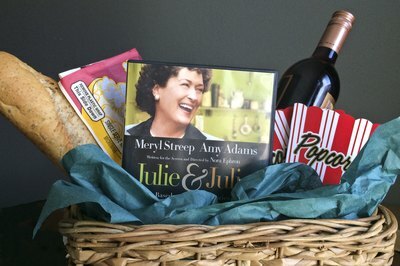 Baskets based on specific movies or movie genres provide ready-made ideas. For example, for the classic favorite "ET," add bags of the candy used in the movie and some fun glow-in-the-dark sticks. 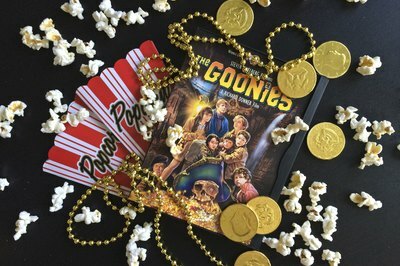 For a treasure-hunt movie such as "The Goonies," add chocolate coins, candy rings and necklaces. For "Karate Kid," add some Japanese candy and Japanese chocolate sticks, which you might find in the international section of your grocery store. 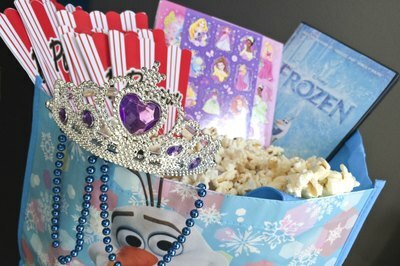 While movie-night baskets for children need the popcorn, candy and favorite movie of traditional baskets, they also may include small toys based on the movie you include, such as Elsa and Anna stickers for "Frozen." Also include favorite foods or gift certificates for food such as macaroni and cheese or pizza. Don't forget easy-to-eat desserts such as brownies or chocolate chip cookies. For adults, choose movies with more mature topics and add gifts along with the mandatory popcorn. For the British drama "Remains of the Day," include a bag of special tea, scones and jam; for "Cocktail," include a bottle of Jamaican rum and a cocktail recipe; and for "My Left Foot," include a loaf of Irish soda bread.